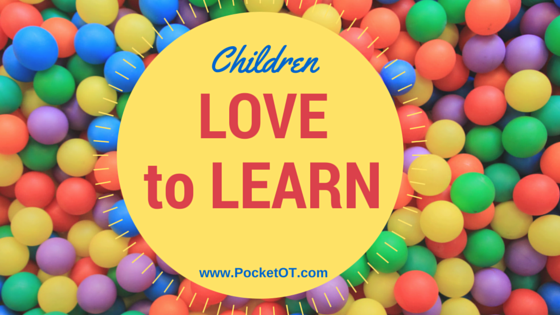 Yes, you read that correctly…..kids play to learn critical skills that they will need throughout their lifetime. Their “occupation” or job is to play. 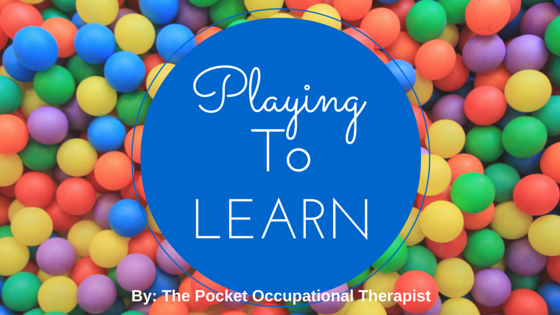 Remember that the slogan for occupational therapy is, “Skills for the JOB of Living.” So, a child’s occupation is to play, study, and learn. Children of all ages learn skills by engaging in play. After all, when children are not asleep they are learning about their environment through various play activities. They enjoy diving hands first into play experiences! Completing the tasks of building blocks, working a puzzle, and drawing pictures will yield skills that the child will use throughout his lifetime. Occupational therapists are fortunate enough to be a critical part of the treatment team for children with special needs. 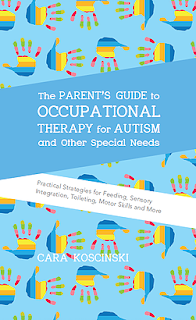 OTs are uniquely trained in “activity analysis.” This means we break down activities into smaller steps and then begin at the step at which the child is successful. Therapists who work with children have become experts in looking at different games and toys to determine which skills a child needs to complete them. When the therapist finds a weakness in a particular skill, we can “prescribe” different games or toys to help improve the skill. It is a fun job to have, indeed! · What does the toy feel like? What is the texture-soft, smooth, rough, hard? · Does the toy have a scent to it? For example, certain dolls smell like fruits. · Is the toy colorful? Are the colors bright and bold or pastel and dull? · Does the child need both hands to manipulate the toy? · Does the child need to read or recognize letters and numbers to enjoy the toy? · Is there a lot of figure-ground information? Examples include puzzles, mazes, word searches, Eye spy puzzles. · Does the toy make noise? · Does the toy require long periods of attention? · Does the toy move, vibrate, or shake? The list above contains a few areas we look at when examining a particular toy. Here’s an example of an analysis of a toy: A child receives a game of Hi Ho Cheery-O. He needs to be able to sit on floor or table for at least ten minutes to play the game (control of his body) (attention); must be able to refrain from placing the small cherry manipulative into his mouth (impulse control) (age-appropriate mouthing), be able to count (number/cognitive (thinking) skills); be willing to interact with another player (social skills); be able to pick up and place the small cherries into the bucket (fine motor/coordination); be able to place the cherries into the correct colored bucket (color recognition); and be willing to accept that he may win or lose the game. Everyone knows that there are ages listed on most games, but they don’t think much about what skills are necessary and at what age those skills develop. It is extremely important to consider children who have developmental delays. Their play and other skills are slower to develop and it is important to give them a toy at which they can be successful. The most important thing to remember when working with your child at home is to begin at a level where he can be successful. Each success will help to build his confidence. No one wants to fail at a task and oftentimes, a child with special needs may lack the confidence to re-try something at which he has previously failed. Be sure to watch your child as he plays to determine which activities he prefers. For example, note if he prefers to engage in messy play or dry play. Does he enjoy colors, shapes, letters, or numbers? When seeking items for your home play time, be sure to remember his favorite color or movie character. His excitement will help him to have fun while learning. Here are some “Out of the POCKET” activities. Fine-motor coordination involves tasks of the hands and fingers such as holding a writing utensil, using a fork, buttoning, and shoe-tying. It is a good idea to help your child to strengthen his fingers for these tasks. 1) Set up activities that you know he will enjoy and have success with. There are many different types of dough recipes that can be found on the internet. Make some dough and add his favorite color to it with a small amount of food coloring or add glitter. Mix two different colors of dough together and see what colors you can make. The addition of different scented oils can heighten the activity to a new sensory level. Peppermint and vanilla oils are commonly found at the grocery store. Note which scents your child prefers. IDEAS: Games that work on fine-motor coordination include: puzzles, stringing beads, Light Bright, Pictionary, Cranium games, dominoes, Battleship, and Perfection. 2) Most children love to open and close things. Be sure to save containers of all shapes and sizes. After cleaning them out, place a special prize inside. Ask your child to open each and find the prize. Prizes can be food, pom-poms, treats, or anything that will be motivating for him. Cut a slit in the top of the lid and ask him to put coins or bingo chips inside the container. This will give him the opportunity to develop good coordination skills. Also, use different eye-droppers or a turkey baster to transfer colored water from cup to cup. Switch from hand to hand or have a race to see who can fill the cup up first. IDEAS: Bingo, chess, checkers, barrel of monkeys, Connect Four, Monopoly, Thin Ice, Marble Run, Ker-Plunk, and Sorry all have items to move and manipulate with the hands. 3) Gross-motor coordination and building up a strong core muscle system will be key factors in determining success with future activities such as bicycle riding, hopping, and playing sports in the future. Even when children are infants, supervised tummy time is important to help muscles work against gravity. Place a motivating object near baby so that he has to lift his head to see it. Use lots of praise and encouragement. To help develop core muscle strength as children get older, it is important to revisit tummy time. Ask your child to watch a small portion of his favorite television show while lying on his belly. As he gets stronger build up the time. Pretending to be animals like snakes crawling in the grasslands is a fun game for older kids. IDEAS: Cranium Hullabaloo, Twister, hopscotch, ring toss, balloon volleyball for excellent gross motor play. Jumping on a trampoline or sports such as basketball and basketball are great ideas. 4) Crawling is a stage often missed by children with developmental delays. The act of crawling helps to strengthen muscles, works to help to integrate the sensory system, and develops coordination of the arms and legs. Often, we need to give extra help to learn to navigate their bodies in the quadruped, or crawling, position. We can get down on the floor with our children and crawl together through mazes made of cushions; under tables; and along paths taped with masking tape. Make sure to encourage fun so that your child doesn’t realize he’s working on skills that may be difficult for him. Allow him to rest when he needs to. Play “spy” by stringing yarn at different heights in the hallway and asking your child to crawl through without touching the yarn. 5) Oral-motor skills are critical to eating, drinking, and speech. Often times the local thrift store is full of affordable tools for building strength in the muscles of the mouth. Straws of different shapes and diameters should be used for drinking or blowing bubbles into a pan of water. Have races by blowing cotton balls and other light items off of the table. The use of age-appropriate whistles is a fun way to get an immediate reward as the child learns to produce sounds by blowing. Place whipped crème onto the child’s lips and ask him to look into a mirror and use his tongue to lick it all off. This will help him to strengthen the tongue muscles and become more aware of its movements. Try it with him and have a race. Use different tastes and textures such as chocolate syrup. 6) Visual skills involve working the eyes together to look at objects, but there is MUCH more than simply “seeing.” Visual-motor integration means that a child is able to make sense of what his eyes see. He can then use his eyes and hands together to complete an activity. Good visual perceptual skills are needed for reading, writing, cutting, and math. A child who has problems with perceptual processing might have difficulties working puzzles, copying block designs, or discriminating shapes, pictures or letters. There are many games to help work on visual skills such as dominoes, card games, old maid, Operation, Mazes, Word Searches, Mahjong, I spy, tanagrams, Memory, Othello, and Pictureka. As you think about your child, keep in mind that he is a child first and he learns critical skills through playing. Play is a child’s work and the avenue through which he learns skills for his future. It will benefit him many fold if you provide him with opportunities to work on his areas of weaknesses while he has fun doing so. The memories and skills you build together will last a lifetime!